While WhatsApp is basically a Mobile Messaging system, it can also be used on Windows PC or Mac to send and receive WhatsApp Messages. You will find below two different methods to use WhatsApp on Computer. The main advantage of using WhatsApp on Computer is that you get to use a large screen, full size keyboard and superior processing power of your computer. The easiest way to use WhatsApp on Computer is to use WhatsApp Web application, which basically mirrors your existing WhatsApp Mobile Account on the bigger screen of your computer. The next method as provided below actually Installs WhatsApp on your computer and you will be to use WhatsApp directly on your computer, without the need to have WhatsApp on your smartphone. 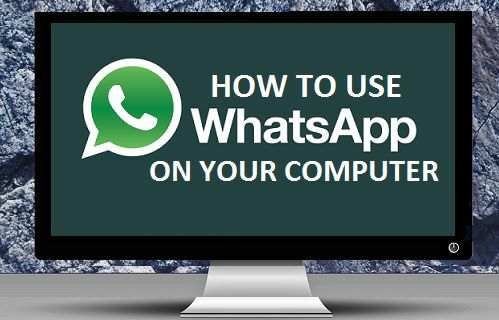 If you already have WhatsApp on your mobile phone, you can use this method to get WhatsApp running on your Windows PC or Mac. 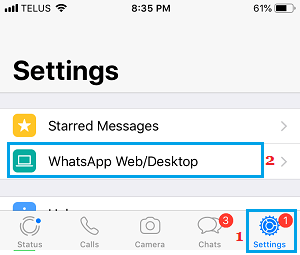 Make sure that your iPhone or Android Phone with an active WhatsApp account is placed near your computer and follow the steps below to Use WhatsApp on Windows PC. 2. You will see a QR Code with instructions to Scan the code using your smartphone. 3. Now, Open WhatsApp on your Android Phone, tap on 3-dots Menu icon > WhatsApp Web. In case of iPhone, tap on Settings > WhatsApp Web/Desktop. 4. On the next screen, tap on OK. Got it and use the Rear Camera of your Phone to scan the QR Code displayed on the screen of your Windows computer. 5. 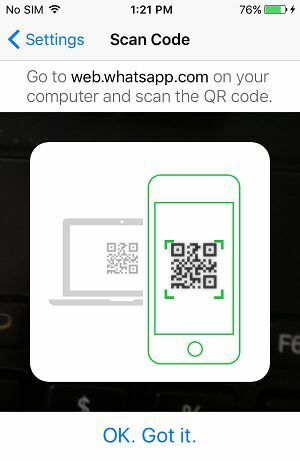 Once the QR Code is scanned, you will immediately see all your WhatsApp Messages appearing on the screen of your Computer. You will basically see your active WhatsApp mobile phone account on the screen of your computer, which allows you to send and receive WhatsApp Messages, directly from your computer. 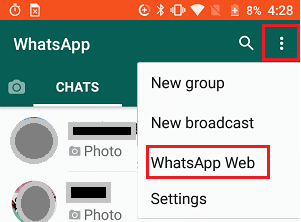 After using WhatsApp on computer, make sure that you Log Out by clicking on 3-dots Menu icon and clicking on Log Out option in the drop-down menu. Note: Just closing the browser tab will still keep you logged in to WhatsApp, it will not log you out of WhatsApp on computer. This method makes use of an Android Emulator known as “BlueStacks” to creates a mobile environment on your computer, which makes it possible to download and install Android Mobile Apps on your computer. BlueStacks is available for both Windows PC and Mac and it is necessary to download & install this application, in order to run Android Apps and Games on your computer. After installing BlueStacks, you will be able to download and use WhatsApp directly on your computer, just like you do on your mobile phone. 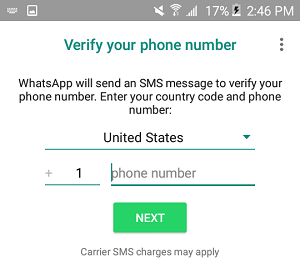 Make sure that you have a phone number ready (Home Phone will do) and follow the steps below to download and Install WhatsApp directly on your computer. 1. Go to bluestacks.com and download the BlueStacks Installer on your computer. 2. Double-click on the downloaded BlueStacks Installer File. Note: In case of Mac, you will have to move the downloaded file to Applications Folder. 3. On the next screen, click on Install Now and follow the Instructions to complete installation of BlueStacks Application on your computer. 4. Next, Open BlueStacks on your computer > search for WhatsApp in the Search bar. 5. Once you are able to find WhatsApp, click on Install to download and Install WhatsApp on your Computer. 6. After WhatsApp is installed, open WhatsApp on your computer by clicking on WhatsApp icon. 7. On the next screen, select your Country, enter your Phone Number and click on Next. Note: You can enter your Home Phone Number, in case you do not have a Mobile Phone Number or do not want to use your mobile phone number for this purpose. 8. 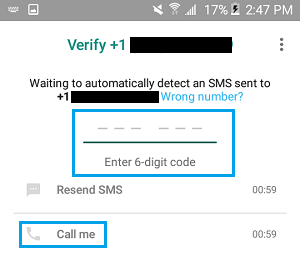 On the next screen, you will see SMS Verification Failed Message (in case you provided home phone number). Click on Call ME option to receive your verification code by an automated call from WhatsApp. 9. Enter the Verification Code as received from WhatsApp and hit the enter key. 10. 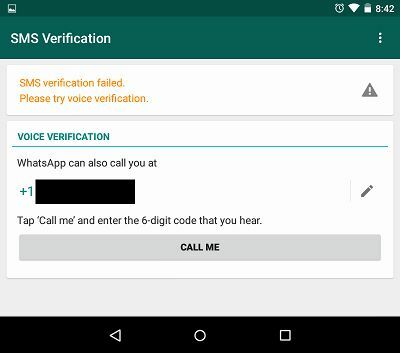 Once your Phone Number is verified, you will immediately see your New WhatsApp Account becoming active on the screen of your computer. WhatsApp is now working on your computer in an Android environment created by BlueStacks. This will allow you to enjoy the full functionality of WhatsApp on your computer. According to BlueStacks, Android Apps and Games should function 6X times faster on your computer, compared to any mobile phone.